I love playing around in the kitchen. Along with all the other wild & crazy ingredients we love to try, we have a ton of herbs & spices on hand. I love to add them to nearly everything—cinnamon to my meusli; allspice, ginger, or nutmeg to pancakes; a particularly good curry blend to sauteed mushrooms. I was curious to see what Leslie Bilderback’s The Complete Idiot’s Guide to Spices & Herbs would cover and contribute to the cook’s repertoire. The book is aimed primarily at folks who want to explore the wide world of flavors available out there and figure out how to use all those spices & herbs in their own cooking. It includes historical and flavor notes regarding the use of a wide array of ingredients, provides suggestions for where to find the unusual ones, and gives the reader many starting points for exploration. Because of this focus it does leave out one detail I was hoping for—substitution suggestions for times when you can’t find the particular spice you’re looking for (I know that spices are all different and there aren’t any exact substitutes, but often there’s something that’ll have a similar flavor effect and will do the job in terms of creating a delicious dish that’s close to the original). That said, there are so many notes on what these items taste like and the elements of flavor that the book will, in many cases, still help you to properly flavor dishes when you don’t have all the ‘right’ ingredients. I’m particularly impressed with the wide array of information on using these ingredients outside of kitchen recipes. Gardening information is included to help you start your own herb garden, and instructions are included for properly drying (via a handful of methods) or freezing fresh herbs for later. There are also instructions for creating your own flavored oils, vinegars, and compound butters under safe conditions. While the phrase ‘spices & herbs’ conjures thoughts of the kitchen for most people, there’s a section on potpourris, sachets, and so on. Finally, there’s a fascinating section on the science of flavor and tasting: the various tastes in foods and how they’re used; the role of such things as scent and temperature in tasting; etc. There’s a surprisingly long selection of spice blend recipes, but I do have one complaint here: many of them are in amounts that aren’t geared toward the home cook. It tends to be easier to multiply than divide such recipes, so I wish the author had started small. I don’t think I’m ever going to make a fish boil recipe (used to flavor boiling liquid for shellfish, or added to seafood dishes in smaller amounts) that starts off with a cup each of four different ingredients, some of which are going to be rather expensive in that amount unless you buy your spices in bulk. In all that particular recipe would total to more than five cups of finished spice mix! If you’re opening a restaurant or experimenting on a large scale (if, for example, you’re studying to become a professional chef) you might find these amounts useful, I imagine. There aren’t many recipes in this book—it’s meant to be informational, with just a few recipes to show you some of the ways in which ingredients can be used. 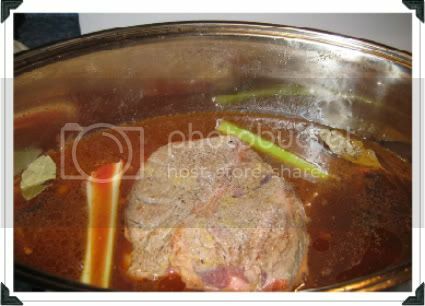 For example, I’ve included a photo below of a coffee-braised roast that we made, which was falling-apart tender and incredibly flavorful & delicious. If you have access to unusual ingredients and want to learn to use them, this is a wonderful book. If you want to create your own culinary masterpieces of flavor, this is a fantastic source of ideas and inspiration. In some ways it’ll be of more use to someone contemplating a career in the food industry, but I definitely recommend it to the adventuresome cook. oh, I love spices…and herbs! I just planted some outside and I love it when I can go out and cut them fresh! bethany: Yum! Next year I definitely want to plant a culinary herb garden. But at least I got my tomatoes this year! 1 Pings/Trackbacks for ""Spices & Herbs" (CIG) Leslie Bilderback, CMB"